Green tea is the oldest form of tea as a standalone beverage. 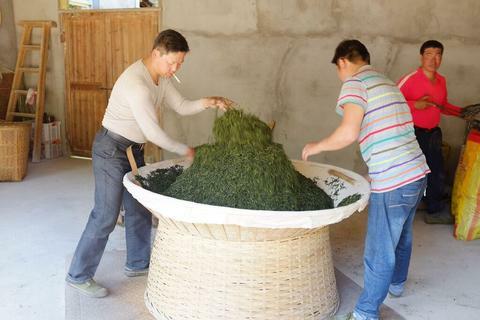 Its processing method, history, and culture are unparalleled by any other tea in Chinese history. From the Han Dynasty, (202BC to 220AD) to the abolition of pressed tribute teas by the Hong Wu Emperor (Zhu Yuan Zhang) in 1391, green tea was THE TEA. Even after the emergence of five additional categories of tea, green tea remains the most studied and refined tea of China, offering us a glimpse of tea as an extravagant form of art during the dynasty times. By definition, green tea is not fermented, however, in reality, enzymes metabolize naturally as soon as the leaves are picked and a micro amount of fermentation is unavoidable. After the leaves are picked from the trees, they are left sitting under shade for a few hours to let the surface moisture evaporate. Then, the freshly picked leaves are treated with high heat to kill the enzymes present, preserving the tea in its freshest state. Thus, green tea retains most of the tea leaf's original properties and taste, and is the most astringent category. Based on processing style, there are four sub-categories of green tea. 2016 has been a very peculiar year for the tea regions of Yunnan. Earlier this year it snowed at some of the high peaks of Nan Nuo Shan. What is usually a quiet area was jammed with traffic from people coming from nearby areas to see snow for what was for most, the first time. As a result of the frost, the Pu Ers budded but didn't grow. After the tea buds the farmers need to wait for it to reach a certain size before they can pick it; this year, it took a very long time to get to that point. There are general patterns to the order of which trees are plucked and when. When talking about the regions, Menghai picks first, then Wu Liang Shan, then Meng La (the 6 ancient mountains). Within each location there are general seasons depending on the type of tree. Plantation tea is the first to be picked, then converted trees, then small trees, with old trees picked last. When picking tea the later the better. While you usually want the first bud, the later that bud sprouts in the season the more desirable it is. Did you know you can tell if a tea is honest by when it is available in the market? By taking into account the type of tea it is and where it is from, we can determine that the tea is available much too early to be authentic. 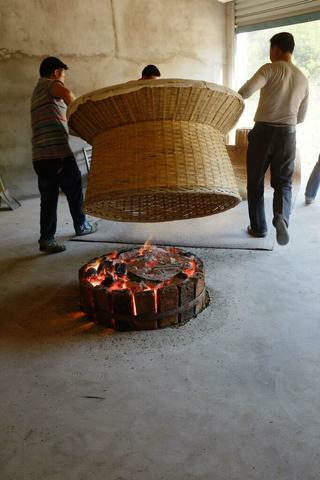 For example, old tree Pu Er from Menghai was picked in the last week. After a Pu Er is picked it still needs to be sorted and in some cases pressed, although true pressing is done in December. Taking all the factors into account, we realize that true old tree Pu Er will not be available for sometime. Yunnan red tea, known as Dian Hong, has a relatively short history, but it does offer an unique opportunity to taste red tea from the Assamic family. Some of them are even made with old trees similar to Pu Er. You can learn more about Dian Hong and watch how it’s made by visiting our video page. In a truck full of tea pickers, Shunan can feel every bump in the rough road. The truck pulls up to the foot of the mountain and the workers file, passing each other their baskets as they begin the long climb. While not the steepest trek, the climb to Hou Kui looks almost vertacle from the bottom. Shunan begins the rough ascension, only stopping to dig out a juicy bamboo shoot along the way. The tea field sits on the side of the mountain, accompanied by stone ridges workers in previous years put in to keep them from slipping. Hou Kui tea has abnormally big leaves for a green tea. The pick for Hou Kui is a little later than some teas. You don’t want a bud that’s too tender or else you wont have enough flavor. Shunan is there relatively early in the season so a lot of the buds are still too young. By 9:30 am the truck pulls back into the processing facility and baskets are once again unloaded from the back, but this time they are full of fresh tea leaves. 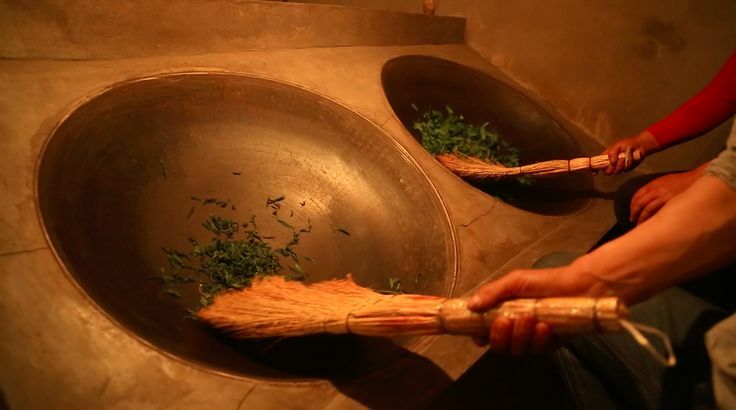 After a careful sifting process, the teas are taken to be stir fried. Stir frying is the mimportant step in green tea making. When the tea leaf is plucked, enzymes inside of the leaf start to ferment. Greens teas are exposed to high heat right away to kill these enzymes, which in turn keep the leaf in its freshest state. In this village Shunan gets another lesson in stir frying tea. She has tried this in every region she goes to, but it is still a technique she has yet to master. Each Time you can hear the cool sizzling of the tea leaf burning. The trick, she is told, is to keep the tea moving and to always have your hand on tea so you don’t burn yourself. The next step is what really makes Hou Kui processing unique, the hand pressing. Every single leaf is individually hand pressed to give it its long shape. To further press the tea they lay a cloth across the hand pressed tea and pull a roller over it. This is what gives Hou Kui those squared markings on the leaf. Though while sometimes faked, a checkered pattern on the leaf is a sign of hand made tea. Shunan sits on top of Lu Shan with a cup of tea looking over the fog which passes below her. The thick fog covers the earth below giving Shunan the feeling she could step off the mountain and walk to the peaks she sees in the distance. The trek up Lu Shan was new for Shunan. An area she hasn’t been before, Lu Shan is one of the coldest tea regions she has visited due to the high elevation. Through the thick fog that rests on the path, you can hear the gentle crunch of ice slipping off the trees. This fog is what gives Lu Shan tea the title “fog tea”. In the past, scholars and rulers would make this trek to show their devotion to their job. A climb like this is not for the weak of heart. Below the peak are the tea fields. The locals rate the tea by how foggy the growing area is; the foggier the better. Since the location is more north than most tea regions and at a higher elevation, the cold prolongs the tea from budding. The old variety is not picked till April 5th, which is the cut off date for picking other teas. Lu Shan has both old variety and new variety teas. In this case though, the old variety gives a better yield then the new variety. While the government gives incentives to grow the new variety the locals secretly keep to the old variety.